Scotland has over 790 offshore islands, most of which are to be found in four main groups: Shetland, Orkney, and the Hebrides, sub-divided into the Inner Hebrides and Outer Hebrides. There are also clusters of islands in the Firth of Clyde, Firth of Forth, and Solway Firth, and numerous small islands within the many bodies of fresh water in Scotland including Loch Lomond and Loch Maree. The largest island is Lewis and Harris which extends to 2,179 square kilometres, and there are a further 200 islands which are greater than 40 hectares in area. Of the remainder, several such as Staffa and the Flannan Isles are well known despite their small size. Some 94 Scottish islands are permanently inhabited, of which 89 are offshore islands. Between 2001 and 2011 Scottish island populations as a whole grew by 4% to 103,702. The geology and geomorphology of the islands is varied. Some, such as Skye and Mull are mountainous, while others like Tiree and Sanday are relatively low lying. Many have bedrock made from ancient Archaean Lewisian Gneiss which was formed 3 billion years ago; Shapinsay and other Orkney islands are formed from Old Red Sandstone, which is 400 million years old; and others such as Rùm from more recent Tertiary volcanoes. Many of the islands are swept by strong tides, and the Corryvreckan tide race between Scarba and Jura is one of the largest whirlpools in the world. Other strong tides are to be found in the Pentland Firth between mainland Scotland and Orkney, and another example is the "Grey Dog" between Scarba and Lunga. The culture of the islands has been affected by the successive influences of Celtic, Norse and English speaking peoples and this is reflected in names given to the islands. Most of the Hebrides have names with Scots Gaelic derivations, whilst those of the Northern Isles tend to be derived from the Viking names. A few have Brythonic, Scots and even perhaps pre-Celtic roots. A feature of modern island life is the low crime rate and they are considered to be amongst the safest places to live in Britain. Orkney was rated as the best place to live in Scotland in both 2013 and 2014 according to the Halifax Quality of Life survey. Rockall is a small rocky islet in the North Atlantic which was declared part of Scotland by the Island of Rockall Act 1972. However, despite no possession by any other state and other precedents, the legality of the claim is disputed by the Republic of Ireland, Denmark and Iceland and some say, it may be unenforceable in international law. Abandoned houses on Fuaigh Mòr, which had a population of 46 prior to being cleared. The local government council areas with the most inhabited islands are Argyll and Bute with 23, Orkney with 20, Shetland with 16 and Highland and Comhairle nan Eilean Siar with 14 each. There are also three in North Ayrshire and one each in Fife, Perth and Kinross, Stirling and West Dunbartonshire. The last three named plus two islands in Argyll and Bute are freshwater rather than offshore. Portree on Skye, an island where the population has grown in recent decades. In the past many smaller islands that are uninhabited today had permanent populations. Losses were severe in many areas during the 19th century when islands such as Pabbay and Fuaigh Mòr were subject to forcible evictions during the Highland Clearances. Mass emigration from the Hebridean islands was at its height in the mid-19th century but it commenced as early as the 1770s in some areas. The crofting counties held 20% of Scotland's population in 1755 but by 1961 this figure had declined to 5%. Other examples include Mingulay, Noss and the St Kilda archipelago, which were abandoned during the course of the 20th century. Declines have been particularly significant in the more remote outlying islands, some of which remain vulnerable to ongoing losses. The following table shows population trends for the ten most populous islands as of the last census. The overall trends are typically growth in populations in the early part of the modern period, followed by declines from the mid 19th century onwards. In every case except Orkney the highest population was recorded prior to 1932 and the lowest post-industrial revolution figure after 1960. Subsequently, there has been modest growth overall, although some islands are continuing to show a decline. Between 1991 and 2001, the population of the islands as a whole fell by 3% to 99,739, although there were 35 islands whose population increased. By contrast, between 2001 and 2011 Scottish island populations as a whole grew by 4% to 103,702. The Scottish Community Alliance noted that "the largest rate of increase has been in the Western Isles (6%) where local people now own approximately 60% of the landmass. Where populations have fallen (Bute, Arran and Islay) community ownership is virtually non-existent." In July 2013, the Scottish Government made the Lerwick Declaration, indicating an intention to decentralise power to the three island council areas of Orkney, Shetland and the Western Isles and later that year made a commitment to do so. In 2017 an Islands bill was introduced to make "island proofing" (including for uninhabited islands) a statutory requirement for public bodies. The Bill completed Stage 1 on 8 February 2018. This is a list of Scottish islands that either have an area greater than 40 hectares (approximately 100 acres) and/or are inhabited. The main groups, from Haswell-Smith (2004), in many cases provide a more useful guide to location than local authority areas. These groups are: Firth of Clyde, Islay, Firth of Lorn, Mull, Small Isles, Skye, Lewis and Harris, Uists and Barra, St Kilda, Orkney, Shetland and Firth of Forth. In a few cases where the island is part of either a recognisable smaller group or an archipelago, or is located away from the main groups, an archipelago, local authority or other descriptive name is used instead. "F" designates a freshwater island. Scotland's islands include thirteen Munros (mountains with a height over 3,000 feet or 914.4 metres), twelve of them found on Skye, and a total of 227 Marilyns (hills with a relative height of at least 150 metres, regardless of absolute height). Dhu Heartach Lighthouse, During Construction by Sam Bough (1822-1878). Sula Sgeir from the South West. The east coast of Mousa towards the Peerie Bard. Four islands were recorded as inhabited in 2011 that were not mentioned in the 2001 census: Eilean dà Mhèinn, Eilean Tioram, Holm of Grimbister and Inner Holm. These following are listed by the National Records of Scotland as "included in the NRS statistical geography for inhabited islands but had no usual residents at the time of either the 2001 or 2011 censuses." None except Lamb Holm are greater than 40 ha in area. There are numerous other freshwater islands, of which the more notable include Lochindorb Castle Island, Loch Leven Castle Island, St Serf's Inch, and Inchmahome, each of which have played an important part in Scottish history. Inchmurrin is the largest freshwater island in the British Isles. It is in Loch Lomond, which contains over sixty other islands. Loch Maree also contains several islands, the largest of which are Eilean Sùbhainn, Garbh Eilean and Eilean Ruairidh Mòr. This is a continuing list of uninhabited Scottish islands smaller than 40 hectares in size. Ruined ecclesiastical buildings remain visible on Eilean Chaluim Chille, near Kilmuir, Skye. The following is a list of places which were formerly islands, but which are no longer so due to silting up, harbour building etc. Scalp na Caoraich, Cridhe An Uisge, Rònach and 'Scalp Phàdraig Mhòir - four small islands at the delta of the River Ness in Inverness which were removed in the 19th century. Broch of Clickimin is a former island in Loch of Clickimin, Lerwick, in Shetland. Originally an offshore island, the loch became cut off from the sea around 200 BC and the island is now connected to dry land by a permanent causeway. Bunglan was once a separate island, but is now connected to Samphrey by two tombolos. Eilean-a-beithich was once one of the Slate Islands and located in Easdale Sound. However, it was quarried to a depth of 76 metres (249 ft) below sea level leaving only the outer rim of the island. This was eventually breached by the sea and little visible sign of the island now remains. Eilean Chaluim Chille is a former island near Kilmuir on Skye in a now drained loch that was associated with the 13th century Hebridean lord Páll, son of Bálki. Inchbroach, also known as Rossie Island, is now part of Montrose harbour. Inch of Culter is a former island in the River Dee near Maryculter. Innis Bheag or Paterson Island near Portmahomack in Easter Ross is now permanently attached to the Morrich More due to shifting sands. Keith Inch (not to be confused with Inchkeith), is now part of Peterhead Harbour, and is the easternmost point of mainland Scotland. King's Inch, on which stood Renfrew Castle. North Inch, one of the "Inches" in Perth, formerly an island in the River Tay. Rosyth Castle also stands on what was once a tidal island in the Firth of Forth, now surrounded by reclaimed land. Preston Island, an artificial construction south of Low Valleyfield, has now been fully reclaimed, using ash slurry from Longannet power station. Viking Bergen Island, a sunken island of the early Holocene. Whiteinch, now an area of Glasgow. Many of Scotland's islands are connected to the mainland and/or other islands by bridge or causeway. Although some people consider them no longer to be islands, they are generally treated as such. Vatersay, which joined to Barra, but not to the above islands. To the north, Scalpay and Great Bernera are connected to Lewis and Harris. The Isle of Skye is connected to the mainland by the Skye Bridge which now incorporates Eilean Bàn. Seil (to mainland) via John Stevenson's 1792 "Bridge over The Atlantic". Hunda is in turn connected to Burray via a causeway. South Walls and Hoy are connected by a causeway called the Ayre. The islands are treated as one entity (Hoy) by the UK census. An undersea tunnel between the archipelago and Caithness, at a length of about 9–10 miles (14–16 km) and a tunnel connecting Orkney Mainland to Shapinsay have been discussed, although little has come of it. Broch of Clickimin is a freshwater islet joined to the mainland by a stone causeway. There is also a bridge from Housay to Bruray. Inchgarvie (part of Forth Bridge), thus joined to both Fife and Lothian on the Mainland. Garbh Eilean at the entrance to Loch Glencoul is now joined to the mainland by both the Kylesku Bridge to the south and its associated roadworks to the north. Innis Chonan, an inhabited island in Loch Awe is connected to the mainland by a small road bridge. A beach on Oronsay by Colonsay, looking towards the Paps of Jura in the distance. Oronsay means "ebb island" and there are several tidal islands of this name. The three main islands of the Monach Islands (Heisgeir), Ceann Iar, Ceann Ear and Shivinish are connected at low tides. It is said that at one time it was also possible to walk all the way to Baleshare, and on to North Uist, five miles away at low tide. In the 16th century, a large tidal wave was said to have washed the route away. St Ninian's Isle is connected to Mainland Shetland by a tombolo. Although greater than 40 hectares in size it fails to meet the definition of an island used in this list as it is only surrounded by water during occasional spring tides and storms. Dùn in St Kilda is separated from Hirta by a shallow strait about 50 metres wide. This is normally impassable but is reputed to dry out on rare occasions. There are a number of offshore islands that defy easy classification. Ceallasaigh Mòr and Ceallasaigh Beag are islands in Loch Maddy, North Uist which are both c. 50 hectares (120 acres) in extent at high tide. At low tide they are connected to one another and several other small tidal islets in the shallow lagoon that surrounds them. Eileanan Iasgaich in Loch Boisdale, South Uist comprises five small islands and several other islets at high tide but forms a single large one of 50 hectares (120 acres) at low tide. Eileanan Chearabhaigh. At low tide these islands form a peninsula with a total area of 49 hectares (120 acres), which is connected to Benbecula by drying sands. At high tide the connection to Benbecula is lost and a number of small islets stretching for over 2 kilometres (1.2 mi) from east to west appear, the largest of which is about 30 hectares (74 acres) in extent. The Crowlin Islands, located in the Inner Sound off Raasay are three separate islands at high tide and a single one of 270 hectares (670 acres) at low tide. Similarly, Lunga in the Firth of Lorn is six or more separate islets at high tide but a single one of 254 hectares (630 acres) at low tide. Many of the Islands of the Forth and southern Orkneys have fortifications from the two world wars. Rosyth Castle stands on a former island. Brother Isle's name is not ecclesiastical in origin as is sometimes stated. This is a list of islands, which are known to be named after someone. In some cases such as North Ronaldsay this status may not be obvious (it isn't named after a "Ronald", unlike South Ronaldsay). This list omits names such as Hildasay, where the person in question is mythological, or Ailsa Craig, where the individual in question is not known, and also Colonsay & Egilsay where the derivation is disputed. Iqbal Singh, the owner of Vacsay, has also expressed wishes to rename it after Robert Burns. Lewis and Harris are separated by a range of hills but form one island, and are sometimes referred to as "Lewis and Harris". Isle of Whithorn and the Black Isle are peninsulas, and Isleornsay is a village which looks out onto the island of Ornsay. There is no commonly accepted derivation for "Burntisland" which had numerous other forms in the past, such as "Brintilun" and "Ye Brint Eland". Gluss Isle at the western entrance to Sullom Voe is one of the many promontories in Orkney and Shetland connected to a larger body of land by an ayre. The name "Inch" (Innis) can mean island (e.g. Inchkenneth, Inchcolm), but is also used for terra firma surrounded by marsh e.g. Markinch, Insch. Eilean is Gaelic for "island". However, Inistrynich, Eilean na Maodail, Eilean Dubh and Liever Island are all promontories on Loch Awe as opposed to islands, despite their names. Likewise Eilean Aoidhe on Loch Fyne. The Black Isle is also An t-Eilean Dubh in Gaelic, while Eilean Glas is part of Scalpay. "-holm" is also common as a suffix in various landlocked placenames, especially in the far south of mainland Scotland e.g. Langholm, Kirk Yetholm, Holmhead (by Cumnock), Holmhill (next to Thornhill, Nithsdale). Some of these were river islands in their time, or dry land surrounded by marsh. "Holm" can be found in an element in Holmsgarth, now a suburb of Lerwick and the Parish of Holm on Mainland Shetland and Mainland Orkney respectively. Neither of these is an island in its own right. Likewise, occasionally an island may be named after a location on the nearby mainland, or a major neighbouring island - or vice versa. Examples of this include: Vementry, which was originally the name of an island, but whose name has been transferred to a nearby farm on Mainland Shetland; Oldany Island, whose name has been transferred to Oldany; Cramond Island which is named after neighbouring Cramond (a district of Edinburgh); and Eilean Mhealasta in the Outer Hebrides, which is named after Mealista on Lewis. ^ Various other definitions are used. For example the General Register Office for Scotland define an island as "a mass of land surrounded by water, separate from the Scottish mainland" but although they include islands linked by bridges etc. this is not clear from this definition. Haswell-Smith (2004) uses "an Island is a piece of land or group of pieces of land which is entirely surrounded by water at Lowest Astronomical Tide and to which there is no permanent means of dry access". This is widely agreed to be unhelpful as it excludes bridged islands. However, the large numbers of small tidal islets essentially defy categorisation. ^ The evidence of maps, sources and photographs makes it clear that South Walls, Eriska and Fraoch-eilean are permanently inhabited. These three are tidal islands, although other similar islands are listed. 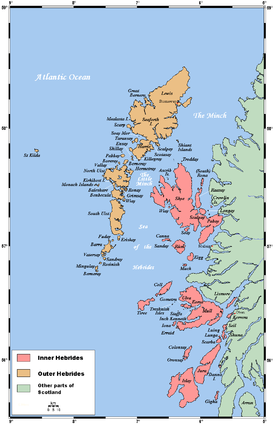 The freshwater islands of Eilean Aigas and Contin Island are also omitted. ^ For a discussion of some of the factors involved see Coull (1967). ^ Island areas indicated with an asterisk are estimates based on Ordnance Survey maps and General Register Office for Scotland statistics. ^ Islands classified as inhabited in the 2001 census but not in 2011, and by implication classified as occasionally inhabited, are indicated with a degree symbol °. ^ This island has a hotel but the census does not refer to the island at all. ^ This island is at (grid reference NF860580) and the evidence of both Ordnance Survey maps and photographs (e.g. "Houses on Seana Bhaile" Geograph. Retrieved 10 August 2009) indicates a resident population. There is even a name, "Seana Bhaile" for the main settlement. However, neither the census nor the main reference work (Haswell-Smith 2004) refer to the island at all. Its small population is presumably included in nearby Grimsay (which has a population of over 800) by the census. ^ Referred to by the National Records of Scotland (2013) as "Inchruin", which is presumably a typographical error. ^ a b c d e f Haswell-Smith, Hamish (2004). The Scottish Islands. Edinburgh: Canongate. ISBN 978-1-84195-454-7. ^ a b "Scotland's 2011 census: Island living on the rise". BBC News. Retrieved 18 August 2013. ^ The Corryvreckan is regularly cited as the third largest whirlpool of the world - see for example "Corryvreckan Whirlpool " Gazetteer for Scotland. Retrieved 19 September 2009. Some sources suggest it is the second largest after the Moskstraumen. ^ Ross, John (5 October 2007). "Isolated Communities Where Violent Crime Comes as a Shock". The Scotsman. Edinburgh. ^ "On This Day: 21 September". BBC. 21 September 1955. Retrieved 2007-08-01. ^ "House of Lords Hansard". 24 June 1997. Retrieved 2007-08-01. ^ "Oral Questions to the Minister of Foreign Affairs". Dáil Éireann. 1 November 1973. Archived from the original on 22 August 2006. Retrieved 2007-01-17. ^ MacDonald (2006) pp. 627–647. ^ "Increase in islands’ population". Scottish Community Alliance. Retrieved 7 September 2013. ^ "Orkney" GENUKI quoting census data. Retrieved 8 September 2013. ^ "POPU08: Historical population, 1000s, by reporting country and time". Nordon. Archived from the original on 2016-11-13. Retrieved 13 November 2016. ^ "Population and elections". Hagstova Føroya. Retrieved 8 September 2013. ^ Ross, David (23 November 2013). "Islands set to win key decision-making powers with unprecedented legislation". The Herald (Glasgow). Retrieved 27 November 2013. ^ "Islands (Scotland) Bill" Scottish Government. Retrieved 24 February 2018. ^ D.A. Bearhop (1997). Munro's Tables. Scottish Mountaineering Club & Trust. ISBN 978-0-907521-53-2. ^ Haswell-Smith (2004), save as otherwise stated. ^ Ordnance Survey. OS Maps Online (Map). 1:25,000. Leisure. Retrieved 21 August 2013. The maps mark the height above sea level of a high point on most islands, but in a sfew cases this is not the highest peak. ^ "Come to our Island and Enjoy...". Isle of Eriska Hotel. Retrieved 9 September 2013. ^ a b The census does not list South Walls as an island, but includes the total in Hoy. ^ "Loch Lomond Islands - Inchmurrin". Loch Lomond.net. Retrieved 20 April 2012. ^ a b Dow, Jim (2005) Islands Galore. A Scottish Islands Handbook. Edinburgh. Black & White Publishing. ^ "Broch of Clickimin" Undiscovered Scotland. Retrieved 20 December 2009. ^ "Slate Islands - The Islands that Roofed the World" southernhebrides.com. Retrieved 14 November 2009. ^ "Local Names" Archived 2011-07-19 at the Wayback Machine Culter.net. Retrieved 3 January 2009. ^ Hansom, JD and Black, SDL (1996) "The Geomorphology of Morrich More: Management Prescription Review" Archived 2016-03-03 at the Wayback Machine (pdf) SNH. Retrieved 29 November 2009. ^ "Preston Island". Gazetteer for Scotland. Retrieved 26 December 2009. ^ Paxton, R.; Shipway, J. (2007). Scotland - Highlands and Islands. Civil Engineering Heritage. London: Thomas Telford Publishing. ISBN 9780727734884. ^ David Lister (September 5, 2005). "Islanders see a brighter future with tunnel vision". The Times. London. Retrieved 2007-04-28. ^ John Ross (10 March 2005). "£100m tunnel to Orkney 'feasible'". The Scotsman. Retrieved 7 April 2017. ^ Clickimin Broch Gazetteer for Scotland. Retrieved 25 April 2010. ^ Pàrlamaid na h-Alba placenames Retrieved 16 July 2007. ^ Fettes College Shetland Landscapes Retrieved 3 August 2007. ^ Burntisland Online Retrieved 22 June 2007. ^ "What is a crannog?". Scottish Crannog Centre. Retrieved 12 November 2016. Bailey, Patrick (1998). "Faroe, Orkney, Gran Canaria: Case Studies in the Geography of Marginal Europe". Geography. 83 (4): 309–21. JSTOR 40573105. Coull, J. R. (1967). "A Comparison of Demographic Trends in the Faroe and Shetland Islands". Transactions of the Institute of British Geographers. 41 (41): 159–66. doi:10.2307/621333. JSTOR 621333. MacDonald, Fraser (2006). "The last outpost of Empire: Rockall and the Cold War". Journal of Historical Geography. 32 (3): 627–647. doi:10.1016/j.jhg.2005.10.009. Turnock, David (1969). "Regional Development in the Crofting Counties". Transactions of the Institute of British Geographers. 48 (48): 189–204. doi:10.2307/621498. JSTOR 621498.